Okay, I’ll admit that this isn’t an everyday look for Mark and I. In fact, it takes a special occasion for us to dress like this. 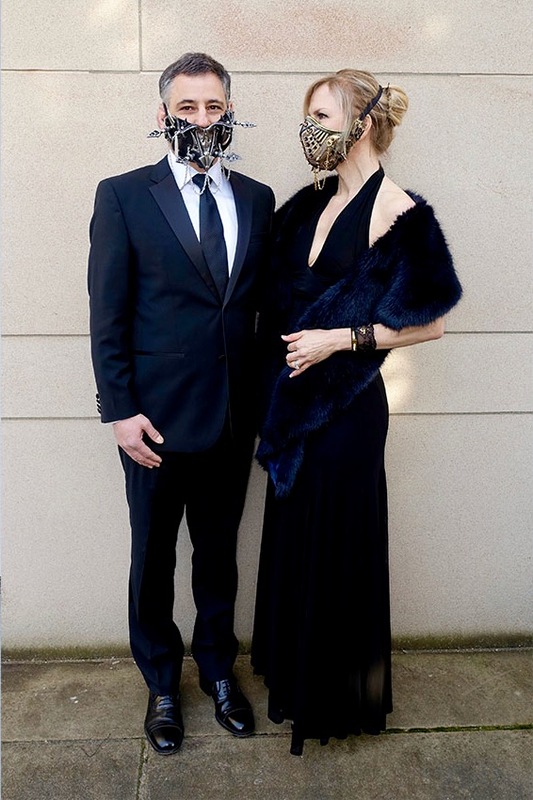 We were so excited to recently purchase these one-of-a-kind examples of wearable art: Lance Victor Moore masks. (Don’t they go well with Mark’s tux and my Valentino gown?) 🙂 When we’re not attending masquerades, the masks are the perfect artwork for our home. So, who’s the man behind these amazing masks? 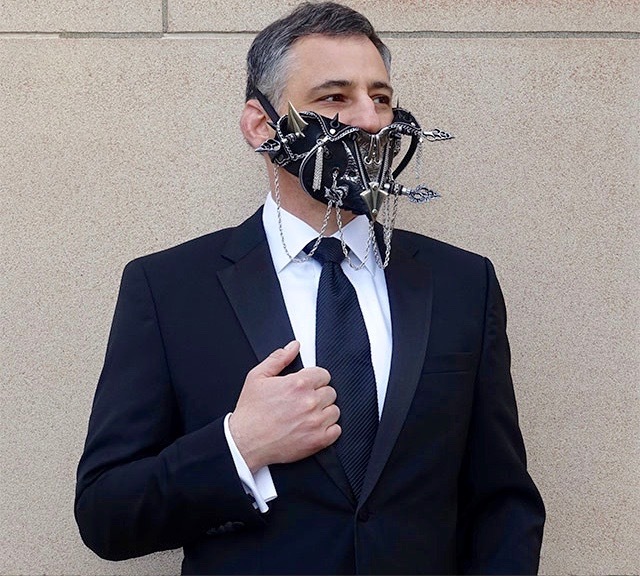 Lance is the artist behind the haute couture masks featured in Emily Payne’s NEW YORK FASHION WEEK and SAN FRANCISCO FASHION WEEK shows. Yes, you can see Lance Victor Moore masks on the runway, not to mention at art and music events. Besides yours truly, designers and celebrities also covet them. 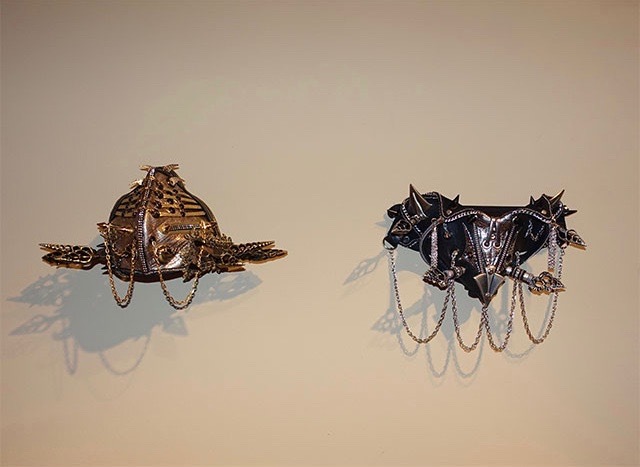 We bought the two pieces shown above from Lance’s “Nature Punk” series. From afar, they look punk and tribal, but up close, I love how you can see that they’re made of natural organic materials. Ours, for example, were made with shells covered with gold/silver. How do you come up with your designs? I generally start with the textile I’m going to use, which will give me a basic color scheme. Most of my masks tend to be somewhat monochromatic. Many are gold or silver with black, for instance. Color scares me sometimes, because it limits the piece, whereas metallics are more universal. With that said, I’m going to be creating some green and blood-red masks and see how that goes. After selecting the textile. I usually do a rough drawing. Masks may have the essence of the initial drawing, but it depends on what I have on hand and how I am able to make things work aesthetically. Also, since a lot of the stuff I use is organic, it tells you what you’re going to do with it. A perfect example of this is the driftwood mask I made when Emily (Payne) requested a wood mask (for her fashion shows). I started with a single piece of wood with a slightly curvy shape, and I split it. I then split it again until I had four pieces that all mirrored each other. That gave me the shape of them crisscrossing, because they’re mirrored shapes, and I mirrored them again. The mask ended up with beautiful lattice work and a really soft look. My boyfriend told me that it reminds him of an old Bentley with the wood veneer, and so, I like to call it the Bentley mask. So, the wood one was very organic. 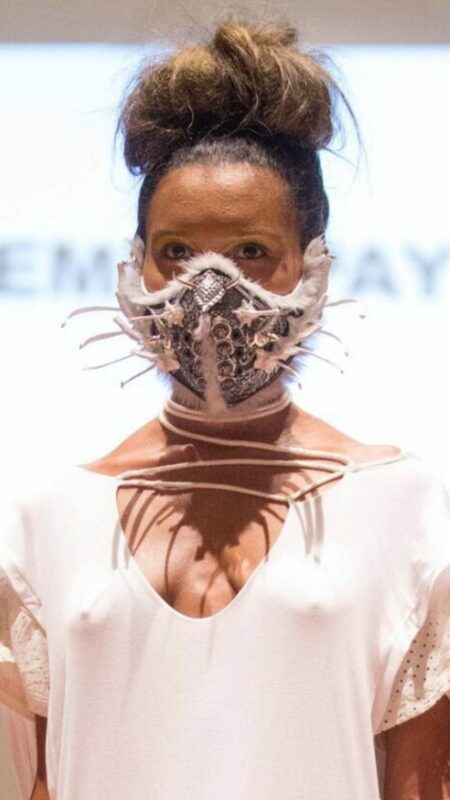 Unfortunately, as people start seeing what they call “dust masks,” they automatically associate them with steam punk. I don’t want my masks to look that way. Although I love steam punk, it just isn’t what I was going for when I was creating Emily’s masks. We wanted the style to have a different reasoning behind it. And so, we steered clear of gears, hinges, and anything else that would automatically be associated with steam punk. Another one that I came up with very organically I made with rabbit fur and a coyote rib cage. For that piece, I had the idea beforehand. I explained the concept of bones sticking out to Emily, and she loved it. But a lot of trial and error were necessary in order to get the bones to stay up and look symmetrical. I bought fifty different bones and used ten, because I had to find some that matched up and were symmetrical. 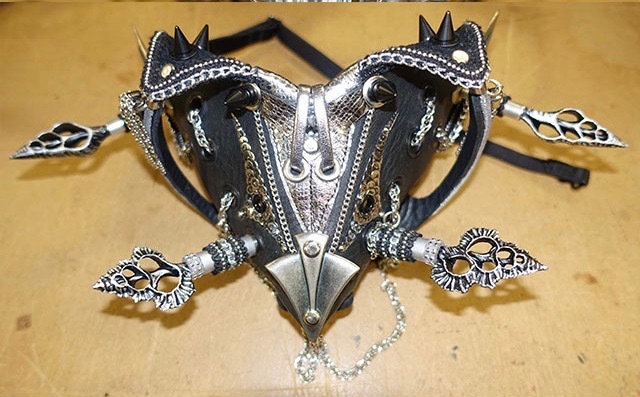 The inside is also interesting, because it’s a mandible which is very heavy-duty but is covered with leather so that you can’t feel or see it. I don’t want the engineering part to jump out or look gimmicky. I want it to serve a purpose, which is to suspend your disbelief on how it was done to a certain degree and allow it to look light and whimsical instead of “well, I can see screws and bolts holding this thing together.” So, a lot of it is also engineering. Yes, it seems like engineering, Lance. But it’s so artfully executed! If you enjoyed learning about these one-of-a-kind works of art that have hit the fashion runway, and their maker, be sure to check back on the blog. 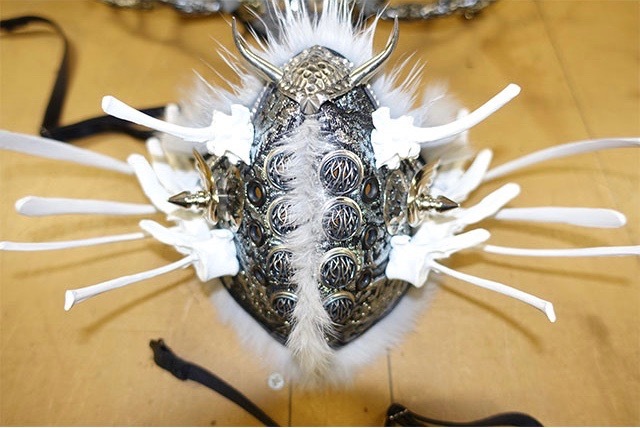 Next week we’ll be continuing this interview, and Lance will share more about his latest butterfly mask, how he’s come to master mask-making, and plans to use his painting background in future designs. 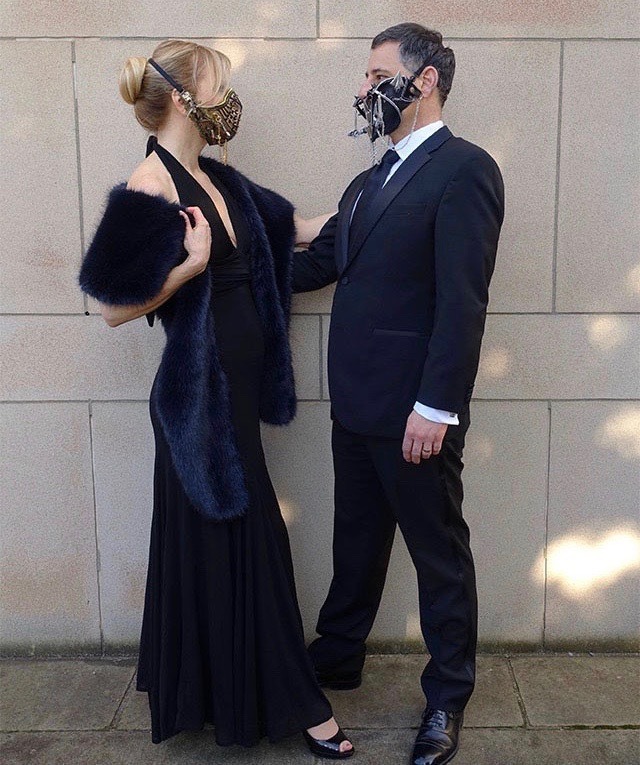 If you’re interested in a mask for yourself, be sure to check out LANCE’S WEBSITE! These masks are amazing; the details are so intriguing, and each one of them is just a one-of-a-kind art piece. The craftsmanship is superb. You see this when you actually hold one. They are very structured and so durable. I love them all. You are so right, Jaime! I love them too! 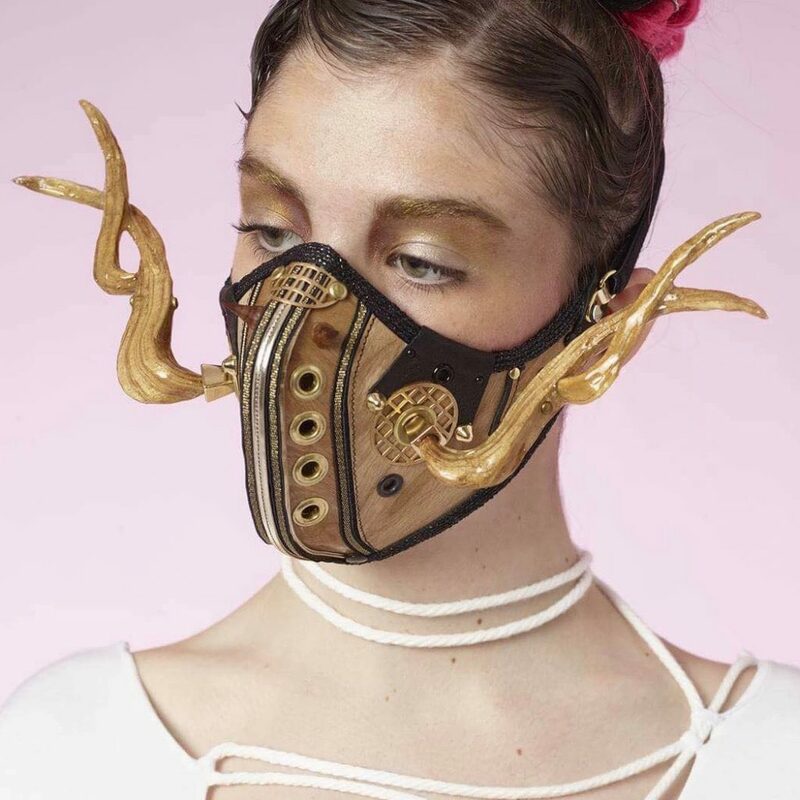 How stunning and absolutely badass are these masks? 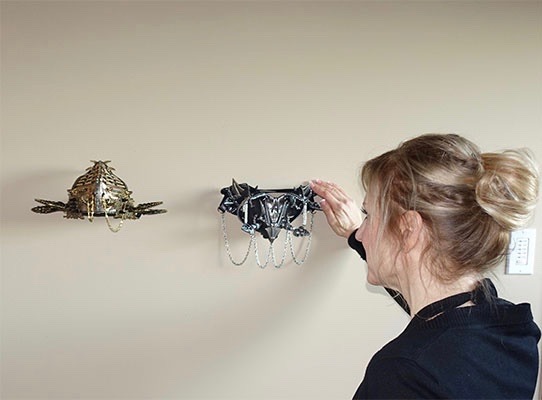 So perfect for a masquerade, and also as lovely + interesting art pieces to add to your home decor!